Coca-Cola reminds me of so much of summer. Growing up we went boating on the Ottawa River every weekend all summer long. I remember popping open a cold can of Coca-Cola or Sprite and quenching my thirst on a hot, humid Ontario summer day. My dad always kept his cooler well-stocked with pop and snacks. Coca-Cola is an iconic brand that I associate with summer fun and being happy. And now I have another chance to reminisce with the newly launched limited edition collection of nail lacquers from OPI. 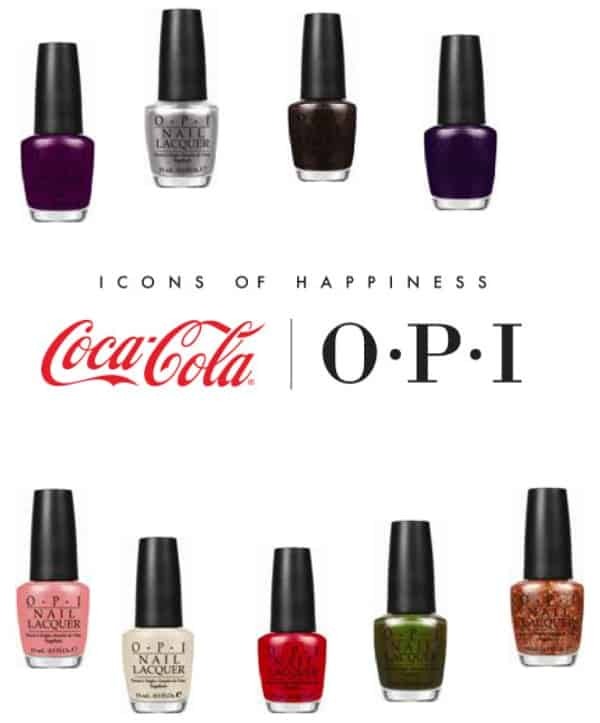 Coca-Cola by OPI is available in spas and salons starting in June 2014. I think a summer launch is fitting for this exciting new partnership! This new collection features a wide range of colours that are inspired by popular brands of The Coca-Cola Company. They are much more than just the red can of Coca-Cola. There’s Sprite, Coke Zero, Cherry Coke and even Fanta Grape and Fanta Orange. Those last two I didn’t realize they were part of the brand until learning about this collection. The colour are a good mix from classic red (no surprise there! ), metallic silver, cream, citrus green and more. Below is the list of the all the shades of the collection including the brand that inspired them. Coca-Cola Red (inspired by Coca-Cola): Classic red- always in style, always perfect. A Grape Affair (inspired by Fanta Grape): Make a big-to-do in this deepest, darkest purple. My two favourites are the shades inspired by Vanilla Coke. I think the soft pink of Sorry I’m Fizzy Today is pretty and feminine. I was most intrigued by the cream coloured You’re So Vain-illa. At first glance I thought it was just an off-white. It’s not though. It reminds me of creamy café au lait. It’s muted, classy and unique. If I was any good at doing nail art, I’d probably do something with this colour and the classic red. I think the two of them together would really make a bold statement. Like I mentioned above, you’ll be able to buy the shades in this collection starting in June 2014 at professional salons and spas across the country. They have an SRP of $10.95/bottle. I have a few other tidbits of information that I wanted to pass along. Also coming out is The Coca-Cola 10 Pack of Style set featuring 8 shades in mini bottles along with a a mini OPI Top Coat and mini OPI Original Nail Envy. This mini pack will retail for $29.95. My daughter is turning 16 this July and think it would make a nice birthday gift. Coca-Cola by OPI will also be available as a GelColor formula starting in June as well. However, you can only try it at a salon since it’s an in-salon, professional service only. When you get a pedicure or manicure done, ask if the salon offers it. Want to win the Coca-Cola by OPI collection of nail lacquers? Make sure to enter my giveaway going on right now! I love O.P.I’s polish & their names. Right now my toes are Cajun Shrimp. They’ll probably be that way all summer. I love the name. I hope your having a great Saturday! I love Orange You Fantastic! I always love a glitter! I like Opi nail polish because they have so many wonderful colors. I like the Sorry I’m Fizzy Today (inspired by Vanilla Coke) color. I want to try it! A Grape Affair is my favorite! Fabulous colors! How very cool! Beautiful colors 🙂 I will definitely be on the lookout for these!! It amazes me how OPI keeps coming up with colours and lines. I’m always interested in what they will come up with next. I wore some sparkly gold polish last month for a banquet I attended. First time in about 20 years that I’ve had polish on my nails. Not into nail polish. I see OPI went it did it again, some more awesome colours!! 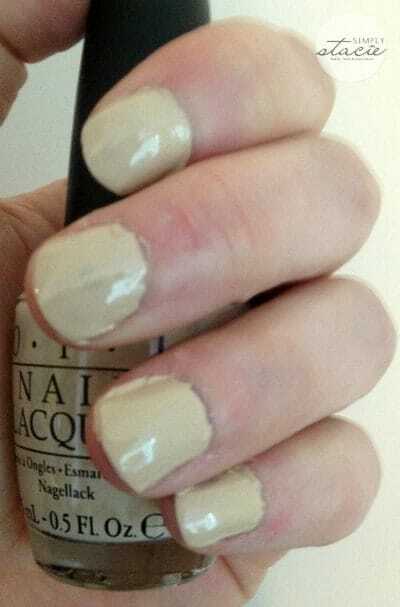 This is an interesting OPI collection inspired by COke and I also do like the look of the Vanilla cream on your nails. Love Opi nail polish and these are all great colours. I totally love the colours! Beautiful! Wow, I like a lot of these shades!! Awesome!! These colours are perfect! Love them!! It’s refreshing to see someone who has the same talent as me at applying nail polish. I tried enlisting my boyfriend to help, because he likes to paint miniatures, but he was even worse. Glad to know not everyone is a talented nail artist! Awww, what fun colors! I always did like OPI (and their collections/names. Seriously whoever comes up with this stuff is pretty creative). Their polish doesn’t tend to chip as much with me either which is nice. In any event, I think this is such a cute line! Whoever comes up with the lines/names for these polishes is pretty darn creative. Also the vanilla looks pretty on you! What fizzy and summery fun! Love the idea of colors inspired by our favorites. It really helps to bring back memories as we paint our nails and show them off. This looks like a great collection that I want to try. What gorgeous colours! Love A Grape Affair, in particular! Great product and great names. Who knew there would be a great line of nail polish with pop names for the colors. Must admit, Not me. I have heard that OPI is a great nail polish. I love all of the fun colors they make.